TALLAHASSEE – Florida’s Republican Gov. Charlie Crist defied members of his own party last week by vetoing anti-teacher legislation that would have eliminated tenure for public school teachers and gutted community-based input into public education. The veto came after massive protests organized by teachers, parents and other public school advocates. The legislation, Senate Bill 6, was the cornerstone of a state GOP effort to restructure public education. It was couched in terms of “rewarding” teachers for improvements in student performance on standardized tests. “We’re thankful that the governor realized what some lawmakers wouldn’t,” said Florida Education Association President Andy Ford. “SB 6 was formulated without an ounce of input from anyone within the public school community. Teachers, administrators and parents weren’t consulted and their views of this radical legislation were dismissed repeatedly by many legislators. But Governor Crist listened,” Ford said in a statement. Crist called the bill “seriously flawed” and also objected to the way in which Florida’s Republican lawmakers rammed the bill through the legislature. Both the Senate bill and its House counterpart had been passed by rather close margins amid a concerted effort by the Florida Education Association to rally teachers statewide against the two bills. Crist has been seeking the Republican nomination for the U.S. Senate seat being vacated by GOP Sen. Mel Martinez. He is facing a primary challenge from ultra-right candidate Marco Rubio, who has been embraced by Tea Party supporters and others who have long questioned Crist’s commitment to their brand of conservatism. 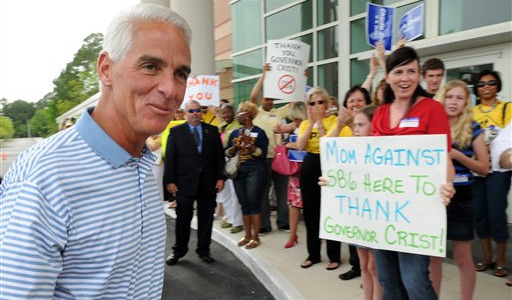 In the wake of his veto, an act in opposition to Florida’s Republican leadership, many expect Crist to drop out of the Republican primary and seek the Senate seat as an independent. If he does so, recent polls show him ahead of both Rubio and Democratic party challengers. Lawrence Albright is an activist, writer, and educator who writes from New Jersey.